Look familiar? Rosie's now assumes Champion's place. Lines out Grand Avenue, tears on half-eaten cinnamon rolls, Champion’s Family Restaurant wrapped it up Friday, Jan. 29, after 44 years in business, the future be damned. 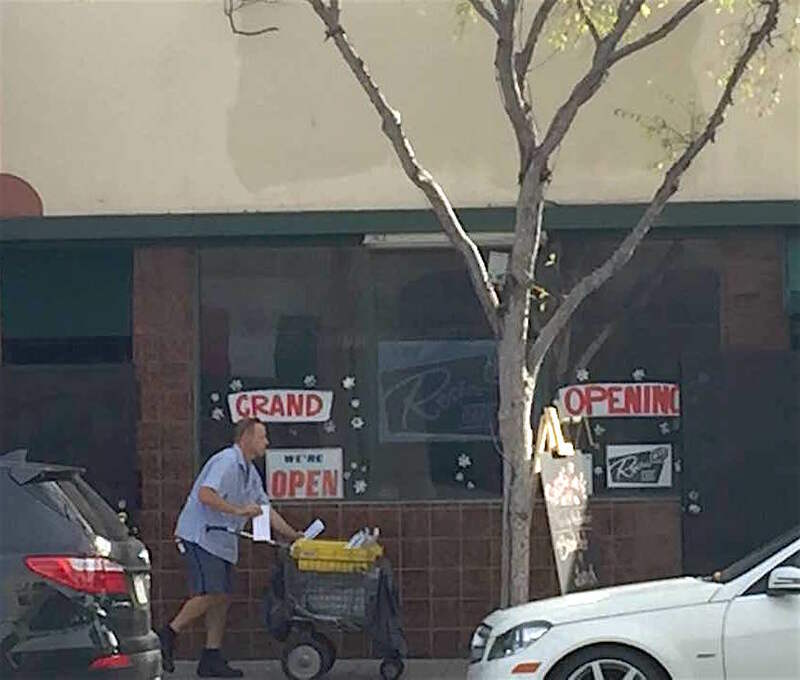 Now, almost a year later, bookending Champion’s run is the new Rosie’s Cafe, which soft-opened with little notice on Saturday, Dec. 3 at 117 Grand Avenue in downtown Escondido. New streamlined Rosie’s menu. Champion’s menu ran on to 18 pages long. Owned and operated by the youthful Kaitlin Rose, under the tutelage and good graces of former Champion’s owner Annette Champion, the cafe quietly started serving up the goods to a small, but select group who happened by the space and saw it was happening. As yet, the only signage are a few hand-made signs affixed to the window and a sandwich board in front of the restaurant. Rose is an Oceanside resident formerly attached to French Bakery Cafe, a well-known bakery and fancy American comfort food spot off East Vista Way in Vista. She has brought along her cousin and other familiar faces to serve what figures to be a massively building crowd from 6 a.m. to 2 p.m. daily at the eatery that seats about 80 patrons. 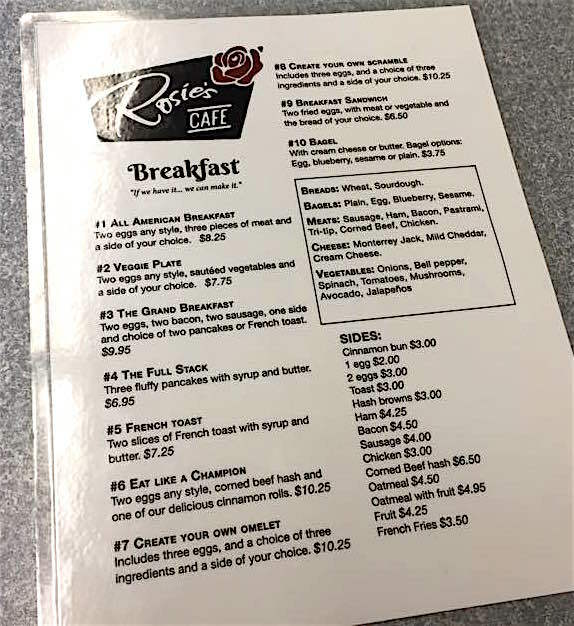 Featured daily, according to Rose, are the famous Champion’s cinnamon buns and corned beef hash from the official Champion family recipe book, along with other Champion’s favorites supplemented by Rosie’s breakfast and lunch menu. Champions customers, who put the fan into fanatic and fantastic, will be happy to see the place looks the same although updated a bit with new carpeting and a thoroughly clean look. The menu remains mainly the same although pared down from the previous 18-page War and Peace version. As noted, it contains the old faves along with burgeoning touches Rose plans to affix to Rosie’s. 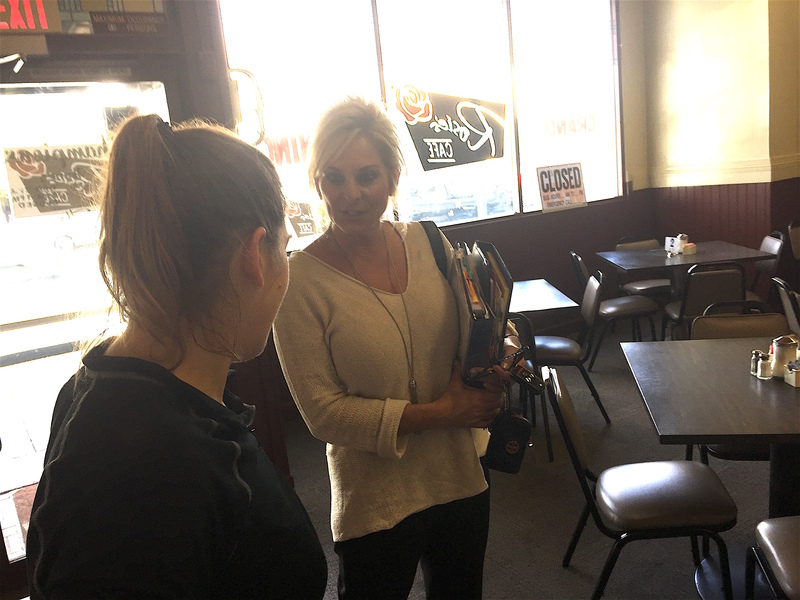 Rosie’s Cafe owner Kaitlyn Rose, left, speaks with a vendor Tuesday at her new restaurant. About 50 to 100 diners have been coming to the unpublicized phoenix of a restaurant spot, but they include former Champion regulars who have been coming back for more, according to Rose. That number is sure to boom, so busting oneself over there while there’s still a few empty tables and spots at the iconic counter remaining available without the long lines of wait seems highly advisable, observers say. Rosie’s Cafe now in business although the signage isn’t quite there yet. Champions’ historic photos and nostalgia remain in place at the new Rosie’s, an homage to an Escondido landmark of the food kind. Champion’s menu read like a trip down memory lane with page after page of historic photos and references mixed in with food choices. “There have been millions of cups of coffee served at 117 Grand Avenue for the past ninety years,” the menu, with page after page of food options and historical data, said. 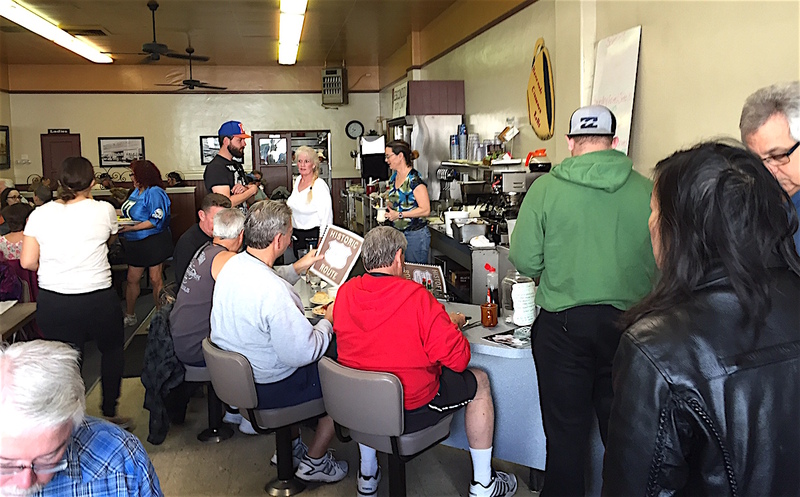 “First called the ‘Chat-o-Chow,’ the lunch counter served as the center of the city gossip and small town politics from 1923, when Escondido’s population was 1,734 residents, to 1948. “In the mid-1960s, the diner was refurbished into a traditional family restaurant by Mr. & Mrs. John Knowles who operated the eatery until then former Escondido Mayor Theodore ‘Ted’ McCain purchased the business and building and the early 1970s he and his wife, Violet, moved ‘McCain’s’ to a new location. And now, the future beckons for Rose who said she was full of vim and vinegar and ready to put an energetic stamp on an iconic restaurant space in downtown Escondido. Champion’s patrons celebrates its last hurrah. 2 Comments on "Champion’s aside, Rosie’s Cafe now open"
We were there the other day. The cinnamon rolls are the exact same! Also, my husband had the corned beef hash (truly home made) and it’s the same! Fresh squeezed orange juice is coming soon. It’s all good. Delighted this iconic home town restaurant is open again. I stopped by yesterday and yes, the corned beef is the same!! Wishing young Kaitlin Rose the very best!